This spacious villa is located in a residential area close to the beach of Sa Coma. It can accommodates up to 8 people. Elegant villa in Sa Coma, not too far from the beach, prepared for 6 to 8 persons. Welcome to this cosy villa with private swimming pool which is located in a very peaceful area, in Sa Coma. 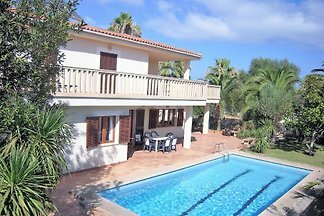 Summer chalet in the urbanization of Sa Coma in the east of Mallorca, with large terraces and capacity for 6 or 8 people. 700 metres away from the paradisaical beach of Sa Coma you will find this fantastic two-storey town house that can comfortably accommodate up to 8 people. Rent successfully your holiday flat or holiday home in Sa Coma in only 20 minutes !